Trust and faith, sometimes there are situations in your life when you just have to trust something outside of your control, and have faith in your own ability. And even at such a young age, he has great confidence and faith in himself, and embraces everything he does with so much enthusiasm. And as I head to the shed for a row today, I’ll be chanting that mantra…just embrace it! For better…or worse! He is recovering quite well..thankyou.. So awesome! 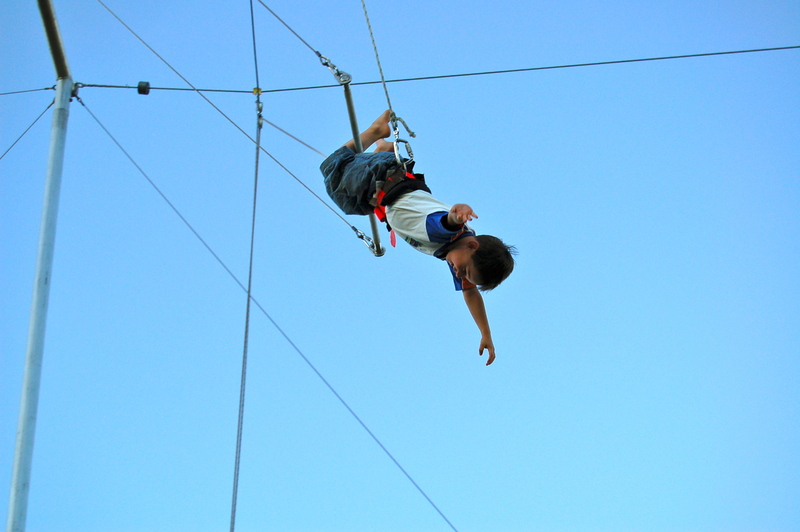 I’ve been wanting to try trapeze stuff, it looks like fun!! TomO is our resident trapeze man! was that his first time? That photo was a couple of years ago, but has done it since… He’s now telling me he can do a tandem skydive in a couple of years, seemingly moving on from the static trapeze! Good for him!! I bet he’ll love it! Ya just gotta love it! Love the photos and message – TomO definitely takes after his dare devil dad! Just hanging around, out and about!